Is Panasonic There Yet? 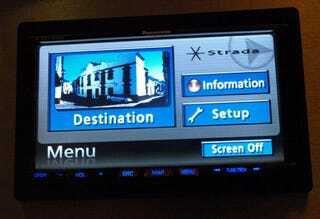 Strada In-Car GPS Debuts But Where's The Portable? The message is not, "Hey, look, Panasonic has an in-dash entertainment system that supports GPS," though for $1,799, that's not a bad message for a certain slice of America who enjoys tricking out their brand new used car. No, the message is, "Panasonic is entering the US GPS market." And unlike Sony, which dabbles in a lot of areas that it doesn't intend to dominate, when Panasonic enters a market, it plays for keeps. (See Panasonic digital cameras and Panasonic plasma TVs for recent examples.) The real question: how soon will we see a Panasonic portable, something that might give Garmin a run for its money? Paul Liao, CTO of Panasonic North America, told me that while he won't discuss particulars, the company is working on one. Follow the jump for Strada specs and a screenshot gallery. The Panasonic CN-NVD905U is now available. It competes directly with double-DINN systems from Alpine and Pioneer, but instead of DVDs, it uses a hard disk drive, meaning 20X faster read speeds. There's an SD card slot and a DVD drive built into the in-dash device. For minor firmware updates, you just download something to an SD card, then insert it. For larger upgrades, the SD card acts as the key, unlocking the hard drive. You then insert a DVD, say, a full Navteq map update, and the disk copies that data. It supports iPods and both Sirius and XM tuners, but only one at a time, unless you buy a $129 4-port adapter. The iPod cable will cost you an extra $49. It supports Sirius Traffic, with the add-on receiver and a subscription. It doesn't support XM NavTraffic. The big story for Panasonic was that the interface made sense. I think there are a lot of nice interfaces in the portable world these days, but it is nice that Panasonic is aware of the importance. Since the device is pretty much a typical double-DINN in-dash system, I only took pictures of the interface itself, since it's what sets it apart. Shots are below. As I mentioned, it's sometimes hard to get excited about an in-dash system, something that is difficult or impossible to install yourself and comes with a bunch of hidden costs, something, after all that, that you can't even take with you when you rent a car in some far off place. My hope is that Panasonic gets going on the portable version, because the portables I've seen from Pioneer and Alpine were also-rans, at best. Bring it, Pana! But beware of Garmin, cuz they're good!